With the opening of the North Warwickshire Line to passengers from Tyseley to Bearley on 1st July 1908, it was soon realised that a new station in Birmingham City Centre was required for the 'residential' traffic that the new line had generated. Designed as a three platformed station with temporary station buildings, just two platforms were built on an island. A traversing table was installed due to the cramped nature of the site, connecting platform 2 and what would have been platform 1, but the table enabled locomotives to run around their trains with the minimum of effort. 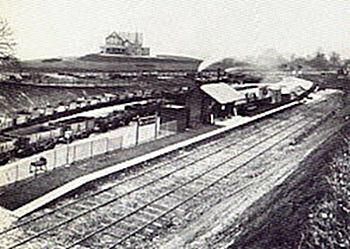 Little provision was made for goods traffic at the station, but in 1910, land and property next the station was bought to provide a suitable goods facility costing the sum of £152,360. Opening on 7th January 1914, the goods station comprised of a 420 feet long twin-track goods shed, offices and many additional sidings that in total could hold over 200 wagons. 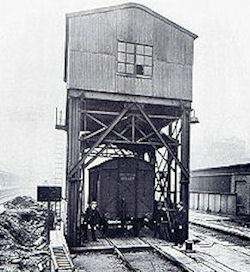 An extensive low-level goods area for 120 wagons was also provided with electric wagon hoists connecting the two levels. Permanent station buildings were installed at this time. Just prior to the opening of the goods station in November 1913, the double track line from Moor Street to Bordesley was quadrupled requiring a new 114 lever frame signal box situated close to the end of the platforms. Controlling both main and relief lines together with Moor Street station layout, the five year old box it replaced was installed at Foxhall Junction near Didcot. 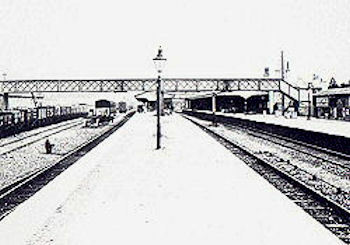 Many small improvements were made to the station area over the next fewyears, mostly additional accommodation for banana storage that was leased to firms in the area, but in 1930, Moor Street finally got its platform number 1 as passenger receipts at this time had deemed the necessity of a supplemental platform. During the Second World War, Moor Street continued to be a vital link in the passenger transport and in the movement of goods, with little change affecting the station for many years, except for the building of the Queensway City Centre ring road that suddenly appeared in 1963 at the stations 'front door'. From the winter of 1966 though, rationalization of the former GWR lines was taking place as the new electrified service from Euston would use New Street Station as its Birmingham terminus. On the 5th March 1967, the main lines between Moor Street and Bordesley were made redundant, then in December of that year, the traversing table were removed and a new ground frame and crossover were installed at the end of platform 3. 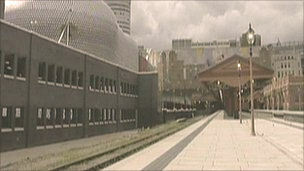 The closure of Snow Hill station also meant that these connecting lines were withdrawn from service on 4th March 1968. Three sidings at Moor Street near to platform number 1 were retired in the winter of 1968 and various changes were made to the points and lines prior to the closure of Moor Street signal box on 1st September 1969. On the 6th of November 1972, the goods depot closed and all of the sidings except one were withdrawn. A council office complete with a multi-storey car park was built on the site of the ground and low-level sidings, whereas British Rail kept the land of the former goods shed as a car park for staff of both Moor Street and the nearby New Street station. The station itself remains open as a vital link for residents from the North Warwickshire Line and after the construction of new platform buildings, business has started to increase again. Situated on the edge of the Mendip Hills, this was the terminus of the 4-mile branch line from Congresbury. The station also housed a small engine shed but this was closed on 31st March 1924. 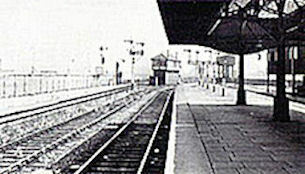 The branch was worked by just one locomotive running to and from Yatton, but when this station was busy in the summer months, the line terminated at Congresbury. Suffering from lack of business, the line closed to all traffic on the 1st of November 1950. In many people's opinion, the station at Bourton - on - the - Water was popular only due to the much admired village that it served, whereas the station itself was not held in such high esteem. Although the station buildings were of a style similar to others of the Banbury & Cheltenham, there was little in the way of amenities. The main station building was rebuilt in the 1930's with Cotswold stone in a remarkably solid looking style, but little else was provided for the travelling public. 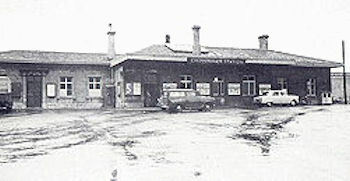 When car ownership became cheaper in the early 1960's, the writing was on the wall for this little station north of the village, and closure came on the 7th of September 1964. 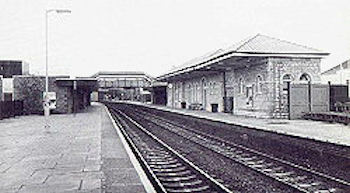 Bridgend station was built as part of the 75 mile portion from Chepstow to Swansea of the South Wales Railway and utilised a double-track broad gauge line. 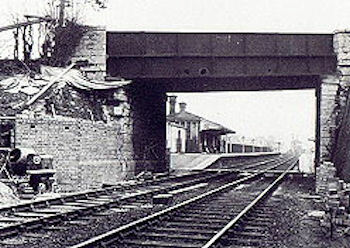 An additional station was built on the same site in April 1868, to accommodate the mixed gauge lines of the Bridgend Railway from Bridgend to Maesteg, but this arrangement lasted until May 1872 when both the Bridgend and South Wales Railway were converted to standard gauge, making the separate station redundant. Another railway that employed Bridgend station was the Vale of Glamorgan line from Barry to Coity Junction on the GWR's Bridgend to Tondu section. Opened on 1st December 1897, the route had a fork just south of Bridgend with one line into GWR's Bridgend station and the other directed over the GWR main line to goods stations at Bridgend and Coity. Opened on 1st December 1897, this line provided a new through route for coal workings from the Llynfi, Garw and Ogmore valleys to Barry Docks. Quiet an amount of space was provided for Bridgend station and its facilities included a one road engine shed, three signal boxes (West, Middle and East), a 175 feet long goods shed and platforms of between 390 feet and 690 feet long. 'Up' and 'Down' goods loops were added in September 1906 and additional sidings were added in 1908 and 1911. In 1923, the Great Western paid £5,000 for six acres of land for the future wagon repair siding that was finally built in 1928 whilst supplemental goods office accommodation was provided in 1931. Wartime work at Bridgend included further goods office accommodation, track circuiting and signalling alterations. Under Bridgend stations' new owners after the war, a period of rationalising affected the small engine shed that was closed in 1950, whilst the first passenger service to be reduced was the Bridgend to Blaengarw working from the 9th February 1953. Local passenger trains from Barry to Bridgend were suspended from 15th June 1964 although freight and diverted passenger trains were able to use the route. One of the largest alterations to affect Bridgend occurred over the weekend of the 11th to 13th September 1965 when Port Talbot MAS was introduced. All signal boxes between Pyle West and Pencoed East, including the three boxes at Bridgend, were closed and the line from Coity Sidings to Bridgend was singled. On the 17th December 1965, following a period of heavy rain, a landslide spread from a cutting a few hundred yards east of Bridgend station. At about 6 a.m., a twelve-coach empty stock train travelling from Swansea to Bristol ran into the landslide and derailed the locomotive and several coaches. At the same time, a train of empty mineral wagons from Newton Abbot to Neath arrived on the scene and hit the stock train head-on. The driver and fireman of the mineral train escaped without serious injury, but both the driver and the second man of the empty stock train were killed. The accident also blocked the Vale of Glamorgan line to Barry. Happier times arrived at Bridgend on 30th November 1979 when the rebuilt station was officially opened by the Secretary of State for Wales. The original stone buildings on the 'down' platform dating from 1850, and classed as listed buildings, were thoroughly spruced up whilst on the 'up' platform, the old timber buildings were replaced by a stone-faced structure complete with a buffet-style kitchen area and waiting room. As the terminus of the 5.4 mile branch from Chippenham, the site of Calne station grew during the periods of the two World Wars, reflecting the growth of the market town itself. In the First World War, additional sidings and a loading bank were provided whilst in the Second World War, the platform was extended to accommodate eight-coach trains. After these alterations, the total capacity available in the sidings and the loading banks amounted to over 200 wagons. Moreover, the station yard also provided private sidings in 1927 to S. M. O. C. & T. Harris, makers of the famous pork pies and other meat products. A survey of 1959 shows that figures for transporting passengers and goods on the branch line were fairly impressive. With over 200,000 passengers arriving and departing, 170,000 parcels going outwards and 35,000 parcels arriving inwards, not to mention freight figures of 16,000 tons inwards and 6,000 tons outwards, nobody could say that the branch did not generate enough traffic. However, on the 5th March 1962, passenger services were reduced during the daytime and late evening, and all Sunday services were withdrawn completely. Worse was to come as all freight working was suspended on the 2nd November 1964, and the abolition of passenger trains from 18th September 1965. Situated at the bottom of a four-mile incline falling from Saperton Tunnel, Chalford will always remain famous in some people's eyes for the auto-trains that worked from Gloucester. The GWR opened its first steam railcar service between Chalford and Stonehouse on 12 October 1903, and this service, extended to Gloucester and worked by auto-train, continued until the stations closure in 1964. Auto-train workings from Chalford to Stonehouse or Gloucester were every hour on the hour, with the 1938 summer timetable showing a weekday service of 16 cars (Saturdays excepted), 19 cars (Saturdays only) and 9 cars on Sundays. The summer timetable for 1947 reduced these services to 12 cars (SX), 13 cars (SO) and just 4 cars for the Sunday workings. Despite this reduction, the auto-train service remained well patronised and the stations last summer timetable showed 11 cars (SX), 12 cars (SO). 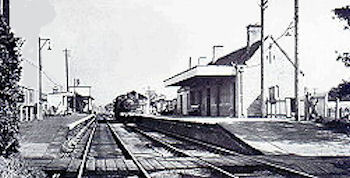 After closure of freight traffic in August 1963, the two sidings to the west of the station were removed in 1964 and the dock siding, main line crossover and the signal box closed in June 1965. Built on the single-line Oxford to Evesham section of the Oxford, Worcester and Wolverhampton Railway, Charlbury has enjoyed a peaceful existence in its countryside setting next to the River Evenlode. The line was doubled from Wolvercote Junction, near Oxford, to Hanborough on 18th November 1853 and on to Charlbury by 1st August 1854. 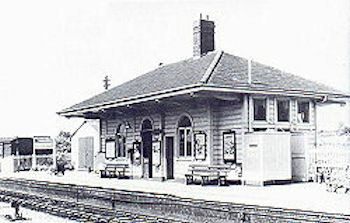 The 'down' platform was extended in 1928, however, all goods facilities were withdrawn in 1970. 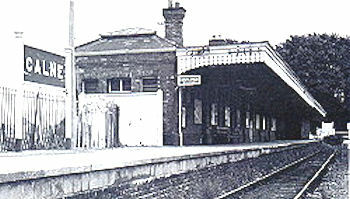 The original station at Chippenham, although not fully completed when the station opened, had buildings with a low-pitched roof that formed a canopy over the station, however when the lines from Warminster to Salisbury and Yeovil to Weymouth opened, the station was considerably enlarged. Completed in mid-1858, the new station incorporated a 194 feet goods shed and an engine shed, but further alteration took place in 1863 following the opening of the 5¼ mile branch to Calne. Several businesses sprung up in the 1900's around the station including a cheese factory, the Wiltshire Bacon Curing Co., a foundry, a brewery and the Bath Stone Works. Just north of the station was a line leading to the Saxby and Farmer Signal Works that later became Westinghouse. With the review of train services, especially freight workings, in the 1960's, several features at Chippenham station disappeared forever. In 1964 the engine shed closed with the loss of the middle siding. The following year saw the closure of the Calne branch together with the Calne bay road. 1966 witnessed the removal of both signal boxes at Chippenham as the layout came under the control of Swindon Panel. 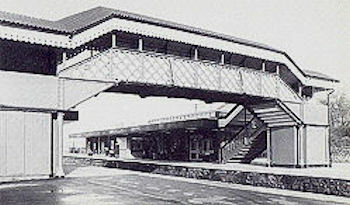 The 'down' bay was removed at this time although the down platform was extended in 1967. 1968 saw the abolition of three sidings in the 'up' yard whilst all 'down' sidings were made redundant in 1976 together with alignment of the track for high speed running. Finally, in 1981, the goods depot was closed.